Getting online reviews can make a difference between someone who contacts you and someone who doesn't. Online reviews play a huge role in local SEO. Is your business helpful? Courteous? Useful? Online reviews can help potential customers find that out. But what if nobody is leaving you reviews? We can help you get online reviews! 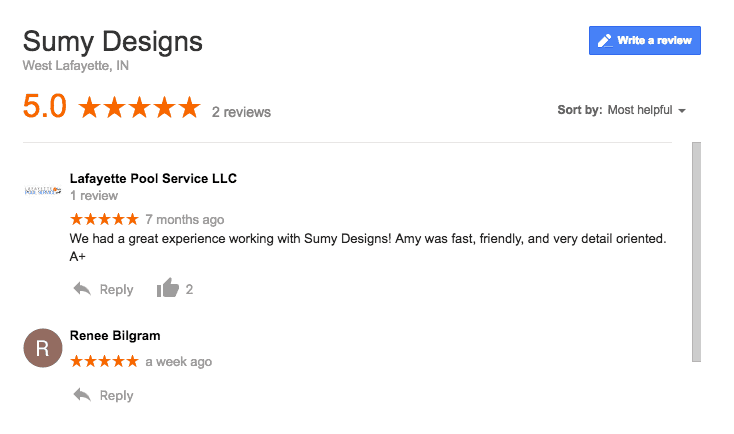 Include positive reviews on your website as well. We start emailing your customers, asking them for feedback. Customers are directed to a private feedback page to leave their responses. If your clients rate you highly, we'll immediately direct them to the online websites of your choice to leave a review. Negative feedback will be stored privately so you can respond as you see fit. We'll alert you to any negative feedback on 3rd party sites and send you routine reports to track performance. Which review sites can we incorporate? Over 40 review sites like Google, Facebook, Trip Advisor and industry review sites are in our system. You pick the sites that will benefit you the most. Interested in talking to us to learn more about how this works? We'd be happy to talk to you about it! All you have to do is enter your customer names and info into a Google document we'll provide. We'll customize a private, branded feedback landing page just for your customers. We'll send you a detailed report each month so you can keep track of your feedback. We do the hard work, you reap the rewards! Let us help you build your online reputation!